The NET RACER platform concentrates the transmission solutions of ERECA products for Broadcast applications. 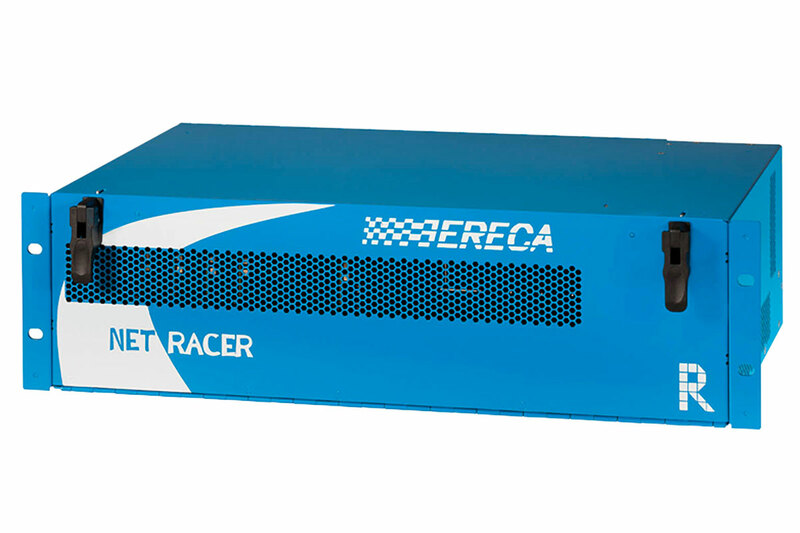 The NET RACER is a 3U rack with 16 slots for transmission ranging from single HD transmission boards to high data rate multi-signals multiplexing and routing to create network solution. Integrated high power supplies extend application usage, like remote powering of devices through Hybrid SMPTE cable. 2 slots for redundant power supply module. Each PSU has 350 W power source capacities. 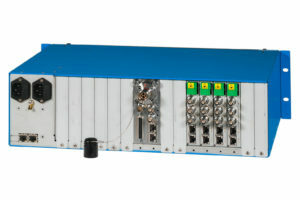 1 management and supervising module with “http” and “snmp” protocol. 1 cooling unit (integrated on the supervising module). 16 “user” slots for transmission solutions of ERECA. Transmission boards and modules drop and insert the rack from the front face. The front door is tip-up type and gives the access to all modules. 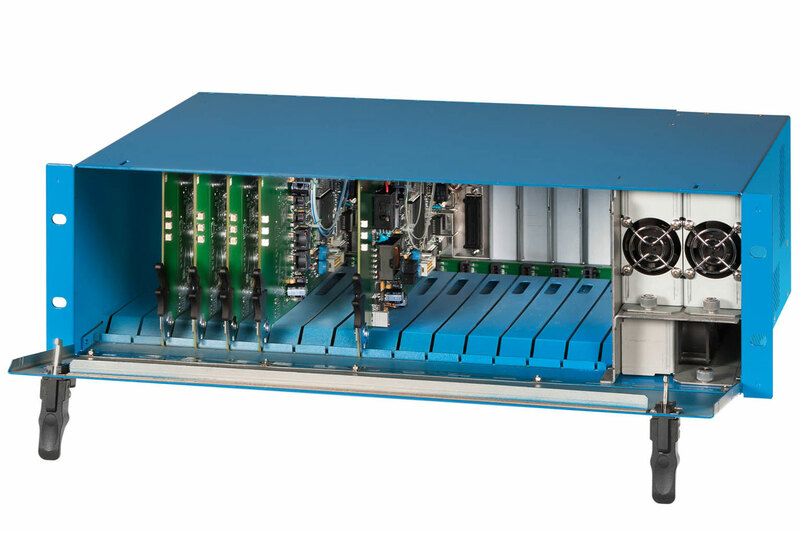 The rack offers a dual flow cooling for harsh environments, cooling of the boards is done from cooling unit at the right of the chassis to the front through a refresh tunnel. Power supply modules have there own cooling unit and use a separate air refreshing circuit. The management module configures all the user boards which required an internal setting. Each user board holds its own settings, and recovers them, even if management module is off the chassis. The management module features 2 RJ45 sockets allowing to daisy chain the modules without the need of an external IP switch. Boards for “multipurpose” transmission, with IP, audio channels, RSxxx, GPIO…multiplexed together. Boards with camera remote powering (through SMPTE cable). 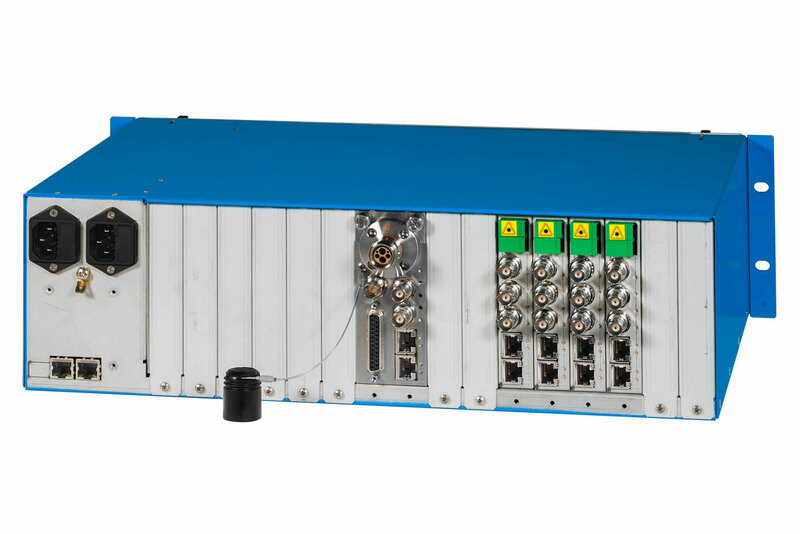 Boards with TDM principle in a 10Gbs format over 2 optical fibers (Trunk 10G and 6 I/O HD). 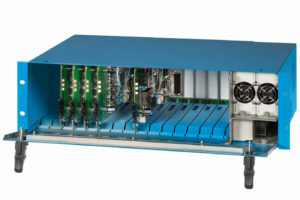 Dimension: 19″ 3RU Chassis RACK, depth 280mm excluding connectors. Chassis capacity: 16 single slot user boards. Management / cooling: 1 Dedicated slot (not shared with a “user” slot). Power supply: 2 Dedicated slots (CEE22 / IEC C14 socket on chassis). Operating T°C: -10 to +50°C.. Efficiency: 87% at full load. Fuses: 2 x 3.15 A slow blow located on CE22 power socket. Redundancy: Oring system with current share, total peak power 700W with the 2 PSU modules. MTBF: 400K Hrs (Excluding fan, about 120Khrs), evaluated at +25°C. Protocol: HTTP web based management / SNMP. Connectors: 2 RJ45 sockets on chassis. (Auto sense for: 10-100Mbs, MDI, Duplex mode). MTBF: 130K Hrs at +25°C. (including fans). Fans: 3 * 19m3/h fans (11 CFM), thermally controlled, current measurement on each.